When she was young her dream was to be an actress, but being business savvy led Dr Anna Mokgokong into the world where she still stands out as a shining star. Born into a family of six, Dr Anna Mokgokong's first interaction with an inspirational woman was with her mother who came from a poor background in the Eastern Cape. "She taught me to multiskill myself. 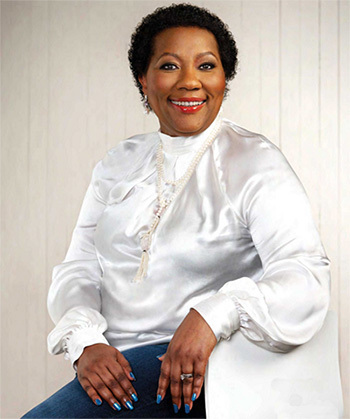 She was a professional, but excelled as a mother and housewife," Dr Mokgokong recalls. "This, to me, meant that you actually can create that perfect balance." Her father provided her with inspiration of a different kind. "He was one of the most resilient people. He taught me to be fearless," she explains. "He was a talented scientist and mathematics teacher and he also excelled in sports. He used to box at the University of Fort Hare with the late President Nelson Mandela," she adds. Dr Mokgokang's family left South Africa for Swaziland in 1959 where she did her schooling. It was at this early age that her entrepreneurial spirit started to shine through. "From a tender age in primary school, I used to sell sandwiches," she recalls. "I did it for pocket money and learnt that running your own business requires hard work and perseverance." Her parents wanted her to become a doctor, which is how she went on to complete her Bachelor of Science degree at the University of Botswana before going to Medunsa to complete her MBChB. "In 1981, whilst studying medicine, I started a business selling handbags and belts to my fellow students and residents at Medunsa. Through a contact in Swaziland, I was given R40 000 worth of stock. The business became a huge success and diversified to include African clothing and curios," she explains. However, the lecturers at medical school did not like the fact that she was running a lucrative business whilst studying and tried to persuade her to drop her business interest and focus on her studies, as she was one of the top-performing students at Medunsa. "I continued with my business and by the time I completed my medical degree I was able to sell my business for R150 000," she admits, adding that she used this capital to establish the Hebron Medical Centre in North West province. Overcoming significant obstacles, Dr Mokgonang built the centre from a zerobase into a primary healthcare and baby welfare clinic with over 40 000 patients. It was during this time that she realised that there were real opportunities in the healthcare arena and established Malesa Investment Holdings, which later became Community Investment Holdings — a 100 percent black-owned company with investments within the key areas of health, technology and logistics. "I remember vividly when I started I could not even afford school fees for the children and had to pass the plate around for contributions. My uncle, Professor Ephraim Mokgokong, acquired a Ford Venture vehicle to transport my kids to school as a contribution to the welfare of all the grandchildren." Dr Mokgokong is a single mother not only to her own two biological children, but to the family and community as well. "On the one hand, I have achieved success. I started from very humble beginnings and I have managed to build a business worth R1 billion. But on the other hand, the life I lead is very skewed towards work. I work long hours, sometimes seven days a week," she admits. She adds that she gets fidgety when she's too relaxed. "My challenge is the high pressure and adrenaline rush I face each morning. I never know where I will be the next day due to the dynamic programme and responsibilities I have." When she does find some leisure time, the doctor enjoys cooking. "I love cooking family dinners with favourite dishes that include chicken, vegetables and salads, soups and baking. I also love interior decorating, moving things around the home, and entertaining guests." When it comes to travel, Dr Mokgokong's destination of choice is home. "My grandchildren from my nieces and nephews think I'm a 'cool gogo'. They get terribly spoilt when they visit, and we boogie and dance together. They copy my dance moves," she says with a laugh. Today,	Community	Investment Holdings, which she jointly owns with business partner Joe Madungandaba, is one of the most successful companies of its kind in the country. When asked how she believes she became successful, Dr Mokgokong admits to having always been ambitious and the expectations on her to be a high achiever. "You must believe in yourself — that you're the best," she emphasises. "As a Christian, I also have strong spiritual support. Every day I pray that I will be able to use my potential to the fullest," she adds. Her advice to other women who seek success is simple: be positive, think ahead and remain focused. "There are so many distractions that women have to define their vision — that is one of the keys to success. My dream is to establish an institute of entrepreneurship for women."